Come and do some hand sewing today with myself and Marguerite @tailortacksandpins at the @childrensmuseumsonomacounty for their monthly Art Jam! We will be sewing up some springtime bunny’s! Check out our the awesome new adults class we are offering! Spend the day with your girlfriends and learn something new! The Kids sewing class dates are now posted on our website. I have group classes and privates available and also something for adults too! Click the link in my bio to check it out. Inspired by working women, with a dash of the Twenties. The Factory Dress slips over the head, features pockets and ready-rolled up sleeves. The Factory dress is ‘easy fit’ so use the bust measurement only for sizing. This is a multi-size paper pattern in an envelope, including sizes 8 – 18. Seam allowances are included in the pattern at 1.5cm, unless otherwise stated. You will need 0.35M of lightweight interfacing for the collar and facing. Inner pockets can be made in self or lining. 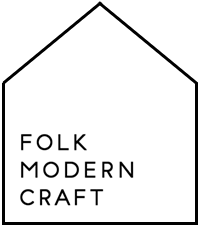 Enter your details to receive occasional updates and promotions from Folk Modern Craft.